There were no soapstone carvings, totem poles or blends of beads and leather. Speakers didn’t flaunt feather headpieces, moccasins or mukluks. Instead, Ojibway comedians and playwrights cruised up in “birch-bark station wagons” and an historic scout roughed the rapids in a “cereal-box canoe.” Served up with a side of braised rabbit and you have . . . an aboriginal art symposium? 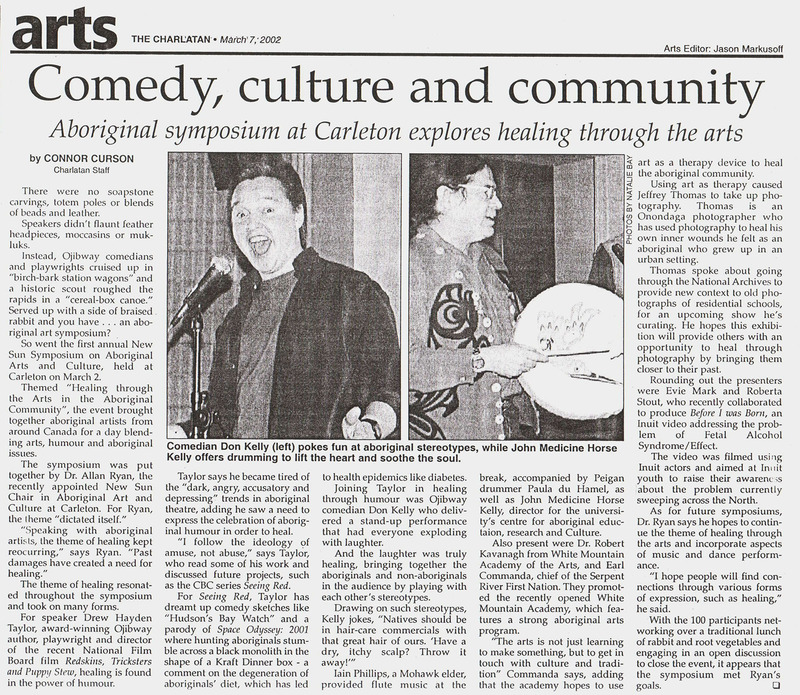 So went the first annual New Sun Symposium on Aboriginal Arts and Culture, held at Carleton on March 2. Themed “Healing through the Arts in the Aboriginal Community,” the event brought together aboriginal artists from around Canada for a day blending arts, humour and aboriginal issues. The symposium was put together by Dr. Allan Ryan, the recently appointed New Sun Chair in Aboriginal Art and Culture at Carleton. For Ryan, the theme “dictated itself.” “Speaking with aboriginal artists, the theme of healing kept recurring,” says Ryan. “Past damages have created a need for healing.” The theme of healing resonated throughout the symposium and took on many forms. For speaker Drew Hayden Taylor, award-winning Ojibway author, playwright and director of the recent National Film Board film Redskins, Tricksters and Puppy Stew, healing is found in the power of humour. Taylor says he became tired of the “dark, angry, accusatory and depressing” trends in aboriginal theatre, adding he saw a need to express the celebration of aboriginal humour in order to heal. “I follow the ideology of amuse, not abuse,” says Taylor, who read some of his work and discussed future projects, such as the CBC series Seeing Red. For Seeing Red, Taylor has dreamt up comedy sketches like “Hudson’s Bay Watch” and a parody of Space Odyssey: 2001 where hunting aboriginals stumble across a black monolith in the shape of a Kraft Dinner box – a comment on the degeneration of aboriginals’ diet, which has led to health epidemics like diabetes. Iain Phillips, a Mohawk elder, provided flute music at the break, accompanied by Peigan drummer Paula du Hamel, as well as John Medicine Horse Kelly, coordinator of the university’s Centre for Aboriginal Education, Research and Culture. Also present were Dr. Robert Kavanagh from White Mountain Academy of the Arts, and Earl Commanda, chief of the Serpent River First Nation.They promoted the recently opened White Mountain Academy, which features a strong aboriginal arts program. “The arts is not just learning to make something, but to get in touch with culture and tradition” Commanda says, adding that the academy hopes to use art as a therapy device to heal the aboriginal community. Using art as therapy caused Jeffrey Thomas to take up photography. Thomas is an Onondaga photographer who has used photography to heal his own inner wounds he felt as an aboriginal who grew up in an urban setting. Thomas spoke about going through the National Archives to provide new context to old photographs of residential schools, for an upcoming show he’s curating. He hopes this exhibition will provide others with an opportunity to heal through photography by bringing them closer to their past. Rounding out the presenters were Evie Mark and Roberta Stout, who recently collaborated to produce Before I Was Born, an Inuit video addressing the problem of Fetal Alcohol Syndrome/Effect. The video was filmed using Inuit actors and aimed at Inuit youth to raise their awareness about the problem currently sweeping across the North. As for future symposiums, Dr. Ryan says he hopes to continue the theme of healing through the arts and incorporate aspects of music and dance performance. “I hope people will find connections through various forms of expression, such as healing,” he said. With the 100 participants networking over a traditional lunch of rabbit and root vegetables and engaging in an open discussion to close the event, it appears that the symposium met Ryan’s goals.